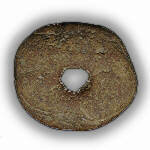 Stone sinker for fish net. Many of us have paced across a point of land on which we've heard that an Indian camp had existed, without finding anything to reward the search. To find arrowheads and other relics look along the caving edges of embankments and bluffs and search for black spots in the sand and gravel. Such deposits of ancient charcoal may mark the remains of an old campground. Mussel shells can be found in such spots, generally partially burned. You may also wish to explore points of land extending into a river or lake, for the Indians often camped in such places, as they offered a vantage point which allowed them to note the approach of an enemy on all sides. Bring a spade or small shovel and a sifter or screen. Take out a couple of spadefuls of earth at a time, put it through the sifter,and carefully examine all the objects that remain. Sometimes exceedingly rare points of obsidian, milky quartz, jasper and jet can be found, along with the rougher points of gray flint, feldspar and such minerals. Do not toss aside anything that you are not sure about; secure a handbook on the subject and study the illustrations. The skin scrapers, hammers and many other objects appear to the untrained eyes to be merely natural stones. 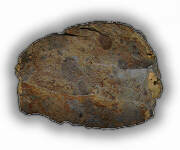 Stone relics may include arrow, spear and dart heads ("points"), scrapers, axes, hammers, clubs, pipes and sinkers. One may also find crude clay pottery marked with rough geometrical designs, although the unearthing of pottery fragments is more common that the discovery of an intact vessel. Note: You must obtain the permission of the land owner before you search for or remove any artifacts from a location. Parks are generally protected areas and any finds should be left undisturbed and reported to park authorities and your local historical society. Burial sites may not be disturbed by law. Other regulations may apply in your locality. Stone scraper for cleaning animal hides.